If you always wanted a trampoline, and you finally decided to get one for yourself or your kid, you need to learn a few things first. What’s most important to look for in a trampoline? Which trampolines are the best? Which safety features are necessary? We got you covered. 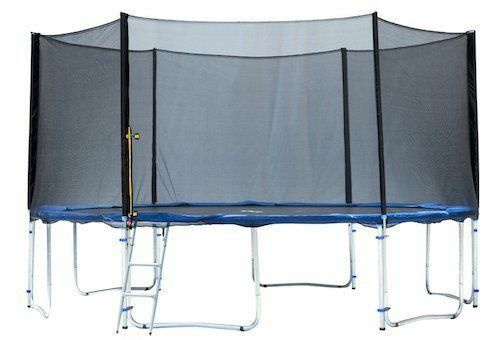 In these Exacme Trampoline reviews, we reviewed three most popular trampolines this brand offers, as well as the most crucial trampoline features. Interested? Keep reading! Bouncing from one trampoline to the other until you find the best one isn’t the best idea, especially as they aren’t all available for testing. That’s why we did these three Exacme trampoline reviews. We checked them, read their specifications thoroughly, and finally tested them ourselves. The first thing we noticed about this model is the fact that it comes with several safety certificates. It has the TUV certificate but is also GST, and UV testing approved. When it comes to the specs, this trampoline has six W-shaped legs that with twelve contact points for better balance. That’s what makes this Exacme model wonderfully stable and safe. This model also comes with 7” gauged springs that add a great bounce and are corrosion resistant. The steel frame of this thing is galvanized and corrosion resistant as well, which means it will last you a long time. You can get this model in several sizes - 8’, 10’, 12’, 15’ and 16’. Weight limits differ depending on the size, but for the model we tried out, the 15ft one, the limit is 375lbs. Based on our research, that is among the highest weight limits on the market for this trampoline size. That’s precisely why this model is our top pick. 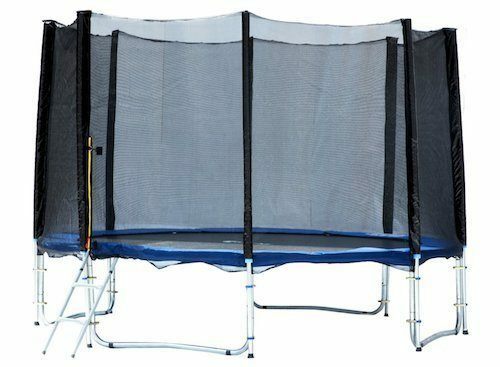 TUV, GST, and UV approved just like every Exacme model; this trampoline is a fantastic choice for smaller kids. It is wonderfully safe, and it has a lovely bounce. When it comes to specifications, this 10ft model has a rust-resistant heavy-duty galvanized steel frame, which means that it can handle a lot of bouncing and even the worst weather conditions. This model has a weight limit of 280lbs, which is pretty high for its size. It also comes with sturdy ropes and straps that secure the net to the trampoline. Another great safety feature are the legs. This model has four U shaped legs that have eight balanced contact points for additional stability. 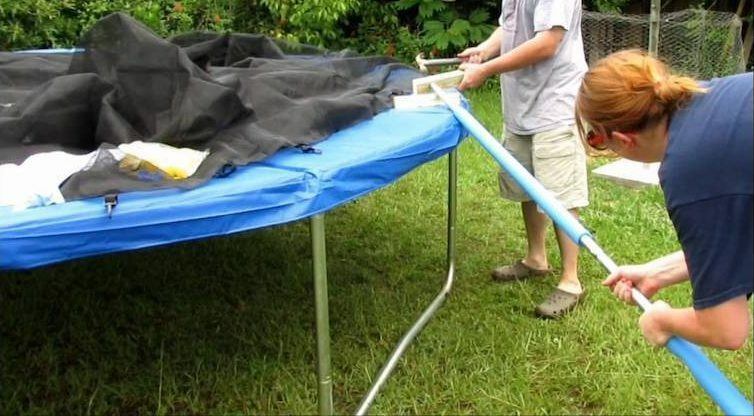 Thanks to these, there’s no chance that this trampoline will wobble or tip over. It seems that every Exacme model has all the necessary safety certificates – TUV, GST, and UV. That doesn’t merely mean that they are safe, it also says that the company pays a lot of attention to its products. When it comes to this model, this care can be seen in the stability of its six W shaped legs that have 12 balanced contact points. You just can’t tip this one. This heavy-duty galvanized steel trampoline has a firm netting enclosure that can be zipped shut. What we find to be a nice touch is the ladder that comes with the trampoline. When assembled, this trampoline is rather large, it is 15’x15’x9’, and it can handle up to 398lbs of weight. That is among the highest weight limits in this category of trampolines. 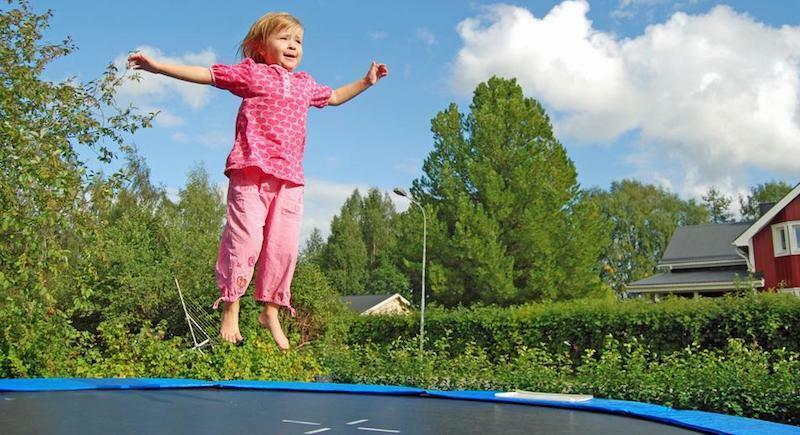 When buying a trampoline, there are several things you need to take into consideration. When we started looking into trampolines, we thought the main criteria was how much fun you can have on it, and how amusing the model looks. Needless to say, we were wrong. There are three main criteria when choosing a trampoline, and here’s why. Might seem silly at first, but you want to pay attention to the shape of the trampoline you’re getting. For one, a round trampoline might not fit your backyard. Also, if you have a narrow yard, you might want to get a rectangular trampoline. Round trampolines have a nice bounce, while oval ones lack it. Octagons are nice and bouncy, while squares can sink in the middle after a while. Do you want a trampoline as a short-term amusement, or as a permanent installation? If you have a small kid, and you want something that will entertain them for several months, then a smaller trampoline is a good choice. On the other hand, if you want your kid to grow into it, or you want to bounce as well, a bigger model will be a better investment. Most people like trampolines, but they avoid buying them because they have the reputation of being unsafe. Well, first, we have to tell you that trampolines are not the most dangerous pastime. Wrestling, football, running, MMA, skateboards – all of these have a higher accident rate than trampolines. If you follow simple rules, every trampoline will be perfectly safe. No horsing around, and only one kid at a time – this is the recipe for perfectly safe trampoline time. As for the durability, you get what you pay for – a cheap trampoline will need some repairs over the years, while more expensive ones will endure longer. Well, in the end, we can only provide Exacme trampoline reviews, and it is up to you to make the final choice. Our top pick and our team’s personal favorite is the Exacme TUV Approved Trampoline with Safety Pad & Enclosure Net & Ladder All-in-One Combo Set model. It comes in many different sizes, and it has an incredible bounce. If you need something smaller, entry number 2 on our list will be perfect, while if you need a real heavy duty trampoline, you should get number 3. Bounce away! 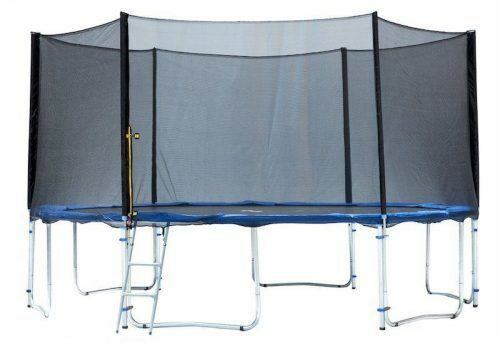 If you're looking for a trampoline with more added features check out this model.